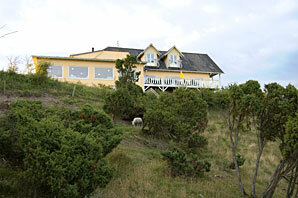 area which gives visitors a beautiful view over the inlet of Mariager. Bramslev Bakker Restaurant also arranges parties in a seperate ballroom. Everything can be arranged , from baptism to sixty-fifth wedding anniversary. Moreover our ballroom is ideal for greater companies whether it is for lunch, dinner or just coffee. If you are interested in more information about menues and planning, you are very welcome to contact us by phone. 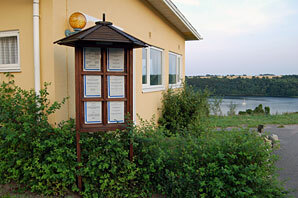 Entrance to Restaurant Bramslev Bakker. Restaurant Bramslev Bakker is open in the summer-season, i.e. from Maundy Thursday untill fall.